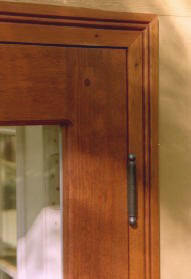 Choosing the right screen door hardware is no less important than choosing the right screen door. For this reason, we’ve made it our business to find a selection of hardware that meets the architectural standards of our screen-storm doors in terms of quality, appearance and functionality. Most of our offerings are not in retail stores, where the shelves are stocked with products designed for the prevailing aluminum screen-storm door market or for the cheap, pine "slammer" doors. At Touchstone Woodworks, we provide a total solution, helping you every step of the way with your project. 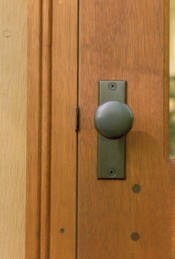 The style and appearance of the Merit 20356 in oil-rubbed bronze is traditional and understated. When you purchase your door and hardware from Touchstone Woodworks, you can rest assured that they will be compatible and you will benefit from our knowledgeable service and support before and after the sale. We will not only help you make an appropriate selection of door style, hardware and finish for your home, but we also provide documentation and continued technical support, including repair parts, should you need them down the road. NEW! We also now offer two options that greatly simplify installation: a Pre-Mortising Option of our Merit and Von Morris latchsets or a complete Pre-Hung Option. 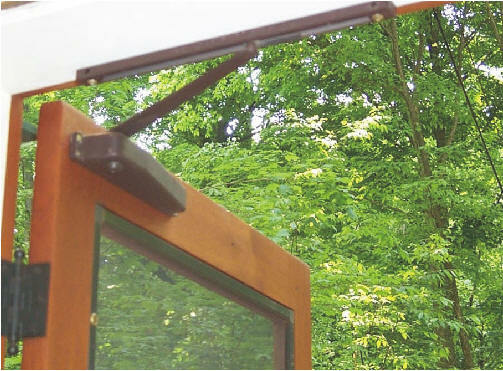 With this option, the screen door comes complete with its own "frame" and the latchset, hinges and strike plate are all pre-mortised, making screen door installation much easier. We can order any hardware finish that you need, but we try to keep the most popular choices in our stock including polished brass, oil-rubbed bronze, satin nickel, antique brass and the Eterna finish from Von Morris. 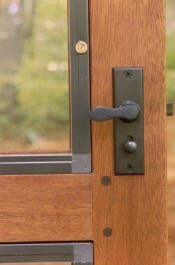 Expect to invest $200 to $300 per door for quality screen door hardware. When you call us for a quote, we will review your needs and recommend an appropriate selection of hardware based on your input to our questions regarding style, finish and functionality.